The Millionaire's Guide to eBook Publishing outlines every step of the book publishing process. It also provides the most comprehensive insiders guide to pay per click advertising available today and explains in detail how it can be used to skyrocket the sales of your book. If your looking for an easy read on ebook publishing, this is it. The Millionaire's Guide to eBook Publishing is a must have for any perspective eBook author. Unlike older publishing books which focus on traditional publishing avenues used in the 80's and 90's, this book explains how the power of the Internet can be harnessed to allow an author to self publish their own eBook. This book is the most up to date and informative resource about On Demand Publishing available today. The author shares his extensive knowledge of eBook development, marketing, and advertising. Using these concepts, you will learn how to create your own money tree. In the past, prospective authors had to hope that their book would be picked up by a publisher and have their work put into print. Today, an informed author can take control of their publishing needs and publish their work themselves. What is an On-Demand Publisher? How to obtain a presence in the Amazon.com marketplace and other major book retailers. How to acquire a web presence and obtain a domain name. Tips on creating a web page for your eBook. How to get your book listed in major search engines. Web page Title & Description Tag tips for optimum search engine placement. What is a PDF (Portable Data Format) file and how to turn your book into one. How to accept credit cards without any up-front costs using PayPal as a merchant. Marketing & Advertising tips using Overture & Google as advertisement mediums. How to use eBay to promote and sell your eBook. The importance of a copyright and how to obtain one from the U.S. Library of Congress. How to create and design your book covers (Front and Back). How to develop new products stemming from your initial eBook. How to generate good book ideas and concepts. How to structure your raw material. How to develop a Table of Contents. Included in this book is a copy of Farber’s best selling eBook, Curb Painting - Money Making Secrets Revealed! This additional text serves as a great resource and "model" to use when developing original eBook content. Not only does it show how to format an eBook but it also shows how information can be sold in a niche market. Millionaire's Guide to eBook Publishing. Reader Lenard Williams from Chicago, Illinois says, "If you are looking for information to teach you how to write a book and get it published on Amazon in a matter of weeks, this is the book for you. This book outlines every step of the book publishing process. It also provides the most comprehensive insiders guide to pay per click advertising available today and explains in detail how it can be used to skyrocket the sales of your book. 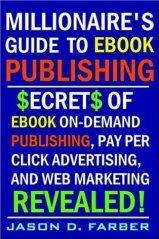 If your looking for an easy read on ebook publishing, this is it."